Fitness trainer measuring waist of female client. Personal trainer measuring progress in training of client. Satisfied woman expressing her success at gym. Sport and diet concept. 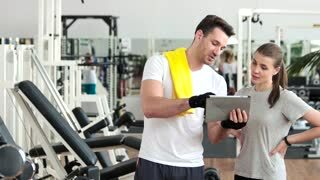 Sporty man ad woman using pc tablet at gym. Couple of young fitness trainers discussing the progress at fitness center. Technology and lifestyle concept. Girl training in gym with personal trainer. 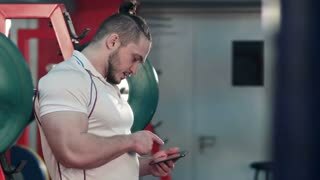 Personal fitness trainer working with his client at gym. People, sport and lifestyle.